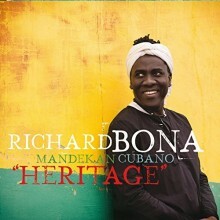 Cameroon musician Richard Bona took on quite a challenge with his eighth album, Heritage, tracing the roots of Cuban music back to the Mandekan empire of the 15th century. To accomplish this daunting feat, he worked with the Afro-Cuban band Mandekan Cubano to tell the musical history of the African rhythms and instruments in Cuba before the slave trade and colonization split Sundiata’s unified kingdom into so many parts. Heritage is “a window into the years of oral stories that have been passed down and placed in the musical prowess of Bona and the Mandekan Cubano,” according to the liner notes. Bona wants to make sure those stories are heard, and that the “beautiful interweaving of multiple backgrounds” present in countries such as Cuba is not ignored, but embraced. The album reclaims and celebrates the music, dance, folklore, and rituals of the West African slave “Cabildos” in Cuba. The result is a musical masterpiece that flows from one track to the next, bound together by its theme and seven extremely talented musicians. Heritage is a wonderful display of musical diversity in Cuba, threaded together by the stories and music brought by the Cabildos of West Africa. Bona aims to make music that showcases the “issues affecting the oppressed or forgotten cultures of the people who so courageously paved the way for the life we presently live.” Throughout the album, this becomes clear, as the listener realizes that “Heritage” is not supposed to suggest old music or traditions that have come and gone, but a dynamic culture and music, one that is constantly changing yet forever shaped by history. This entry was posted in World Music and tagged 2016 music, 2016 Releases, album review, black music, Heritage, Richard Bona, Richard Bona & Mandekan Cubano, World Music by aaamc. Bookmark the permalink.